Ezekiel 47 and other passages from the OT prophets foresaw a river of life which one day would flow from the heart of the New Temple in the age to come. Our Lord identifies himself as the New Temple (John 2:20-21) and as the one from whom the river of life will flow (John 7:38). John 19:34 is a sign of the fulfillment of that promise. Of course, the physical flow from Christ’s side is not the ultimate point. It is a sign of a deeper reality, the true “river of life” that flows from him, which is the Holy Spirit. Furthermore, throughout the Gospel of John, water is employed with reference to Baptism, and blood is only discussed in the Eucharistic discourse of John 6. So the Fathers were right to see in the bloody flow from the side of Christ the River of the Spirit, which comes to us through the sacraments, Baptismal Water and Eucharistic Blood. The sacraments are efficacious signs of God’s mercy and the communication of the Spirit to us. In addition to being a Hillel Psalm, Psalm 118 is also a Todah psalm, a psalm for the Todah or Thanksgiving Sacrifice. The Thanksgiving Sacrifice is a theologically very significant Old Testament form of worship. Unlike many other forms of sacrifice, the Todah was not offered to expiate sin or guilt, but to express thanks to God for a particular act of deliverance. In the context of the Passover, the act of deliverance that Psalm 118 expressed thanks for was the Exodus from Egypt. Transmuted into the New Covenant, however, Psalm 118 now expresses our thanks for the New Exodus that Jesus Christ has made possible for us, in the context of our New Passover, the Eucharist, the definitive “Sacrifice of Thanksgiving,” the new Todah. The refrain says, “Give thanks (Todah) to the LORD, for he is good, his love is everlasting.” And one of the verses says, “His mercy endures for ever.” Actually, the word translated “love” and “mercy” are actually the same in Hebrew: it is the word hesed, which can mean “love” or “mercy” but whose meaning is actually more technical: it is the term for covenant fidelity. “Hesed” describes how covenant partners are supposed to treat one another: so yes, it includes concepts of love, mercy, longsuffering, but all within a covenantal context, a context of being in an oath-bound familial relationship. 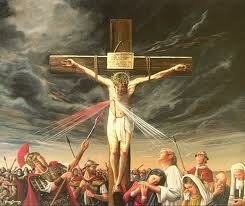 Divine Mercy Sunday is really a celebration of God’s hesed—his faithfulness to the covenant. God does not show mercy to us arbitrarily: he shows mercy because he has promised to do so, he has sworn to do so by multiple oaths throughout salvation history (cf. Gen 22:15-18). As a Protestant pastor, I used to place great emphasis on salvation “by faith alone,” but it is interesting to note that St. John teaches here that assurance of salvation (“This is the way that we know …”) is the result of actually putting into effect the commands of God (“when we love God and obey his commandments."). St. John describes Jesus Christ as “the one who came through water and blood,” which is, among other things, a reference back to the famous scene in the Gospel that we mentioned at the beginning of the post, John 19:34-35. Jesus came “through water and blood”—which may also refer to his manifestation of his divinity at the Baptism and the Cross (the bookends of John’s Gospel)—and he continues to come to us through water and blood, that is, through Baptism and Eucharist. Through these sacraments, we are filled with the Spirit who is Truth. On Good Friday we read about Pilate asking his famous question, “What is Truth?” (John 18:38). Here the Apostle provides an answer: it is the Spirit of God. He leads us into all truth. Let’s not fall into the trap of thinking, “Faith was easy then, but now it’s hard.” It was hard for the first disciples to believe that Jesus of Nazareth, a man they knew and with whom they ate, was also the God who revealed himself to Moses. After all, Our Lord looked normal. Aside from a few incidents which only a few witnessed (the Transfiguration), his body looked similar to other men’s bodies. No halo followed him around. He did all the things other people did. He performed miracles—but so had other prophets who were not divine. So we should not underestimated the demands on the faith of the first Apostles. Likewise, we should not exaggerate the demands on our faith today. In many ways we are blessed with a long tradition and a great deal of truth and insight that the Church has been given over two thousand years. We have categories and language to speak accurately about how Jesus can be both God and Man (one “person,” two “natures”) and how the Eucharist can be his body (“substance” and “accidents”). This intellectual framework is a help to faith, as is the clarity and coherence of teaching readily available to us in, for example, the Catechism. Embrace of Christ and his claims always has required an act of faith, both for Thomas and for us. Christ gave him helps for his faith—but he gives us helps, too. Let’s not make excuses; let’s make the good confession. The description of the people as being of one heart and soul calls to mind Deut 30:1-10, but the possibilities held out there to those who return with heart and soul to God are being reversed by the early Christians. They are dispossessing themselves of the land. The 'charismatic communism" appears to have only been practiced in the Holy Land. Might it be that the practice was a prophetic sign? Is it possible they were dispossessing themselves of the Holy Land in view of what was to come upon it (Luke 19:41-44; Luke 21:20-24)? Beautiful article. I knew that the Lord had compared His Body to the Temple. But I had never thought of the blood flowing out of it into the River and mixing there with the water. It always astounds me how God leaves no string untied. Everything fits. What beautiful imagery. Anyone who has ever had such a thought should read the history of the Jewish people in the Old Testament. Faith has never been easy. If even those people who saw and heard God on the mountain, who saw the waters turn to blood and all the plagues and who saw walked across the River with walls of water on both sides. If even they could doubt God. Not to mention those who walked with Jesus and saw the loaves multiplied, the sick healed, the blind to see. If even they could doubt. Faith was not easy for me. But that brings me back to what Jesus told Thomas, "Have you come to believe because you have seen me? Blessed are those who have not seen and have believed." There are some wonderful people to whom faith comes easy. They need and demand no proof. God be praised for those people. May they be forever blessed. @De Maria: thanks for your remarks! @DimBulb: fascinating idea. I haven't thought down that line very much. Initially one idea that occurs is that the early Christian community, by dispossessing themselves of the land, are almost acting like the "kingdom of priests" promised to Israel (Ex 19:6) because priests do not have a geographical inheritance. But it's only an initial thought. I enjoyed the article very much and it stuck in my mind. Suddenly I saw a connection to the Theology of the Body. The womb and its red flow, could also be considered a Temple of God, where He knits us in the womb (Psalm 139:13). @De Maria: Yes, IMO you are correct, and there is much more there. The womb is connected to the earth (Ps 139:15). Now compare Jn 19:41, and ponder what the "tomb" (in the earth) that bore Jesus and the "womb" that bore Jesus have in common, and how they are connected to the Church as Temple and each believer as Temple.